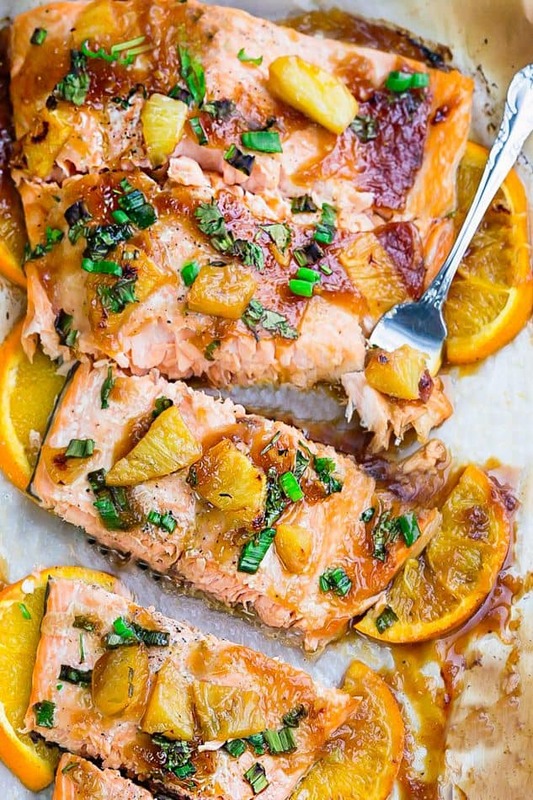 Pineapple Orange Teriyaki Salmon baked in foil or parchment – the perfect easy weeknight dish. Best of all, this healthy recipe takes just 20 minutes to make – skip the takeout! We happen to be big salmon fans over here. We usually rotate between Honey Lemon Salmon, Honey Lime Salmon and Orange Salmon. They show up on our dinner table at least twice a week and I love how quickly it cooks up in the oven. 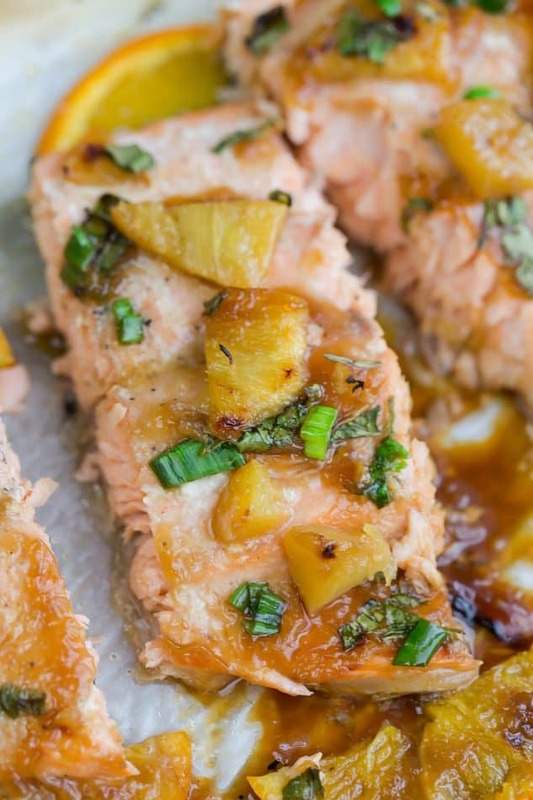 This Pineapple Orange Teriyaki Salmon is one of our latest favorites and takes less than 25 minutes to put together. It’s loaded with tons of flavor and is perfect for busy weeknights. And the best part? Cleanup is a breeze! 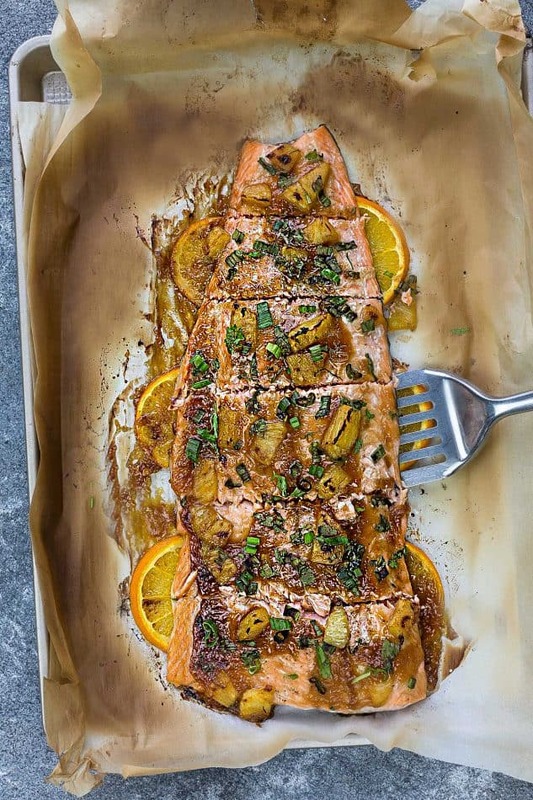 Simply place the salmon on a large baking sheet lined with either parchment paper or foil. After it’s done, just toss away your liner or use it to wrap up any remaining leftovers for your meal the next day. Seriously, it doesn’t get easier than that, right? Start off by seasoning the salmon with some salt, black pepper and a drizzle of sesame oil. 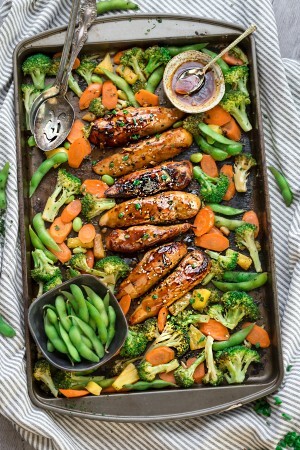 For the homemade teriyaki sauce, combine soy sauce, rice vinegar, cornstarch, honey, ginger and garlic. Orange juice and pineapples are added for an extra tropical touch. 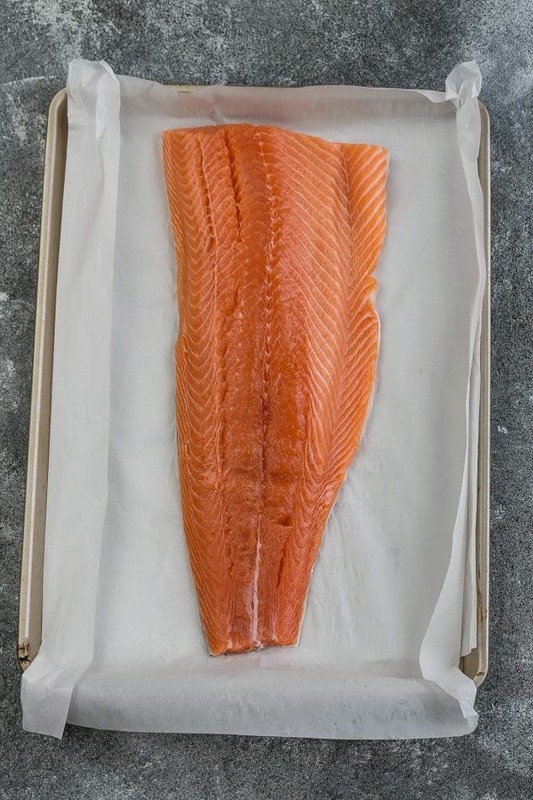 Wrap with foil and bake until tender and flaky – about 12-16 minutes depending on the thickness of the salmon. To seal in the flavors, broil for 3-5 minutes until ends of the salmon are slightly charred. Don’t forget to reserve some extra sauce to drizzle at the end. Finally, serve this salmon with your favorite sides to make it a complete meal. Preheat oven to 400 F degrees. Line a baking sheet with a large sheet of parchment paper or aluminum foil. Lay salmon on top and season with salt, pepper and sesame oil. 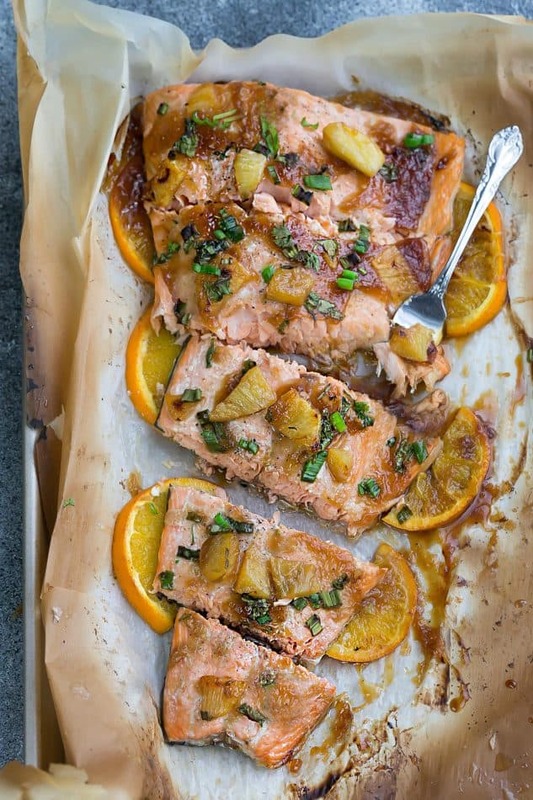 Slide orange slices halfway underneath the salmon, as pictured. In a saucepan over medium-high heat, whisk together soy sauce, vinegar, honey, sesame oil, orange juice, garlic, ginger and cornstarch. Bring to a boil and allow to thicken and bubble. Add pineapple (and water as needed if sauce is too thick) then pour enough sauce to evenly cover salmon (reserving some for drizzling before serving). 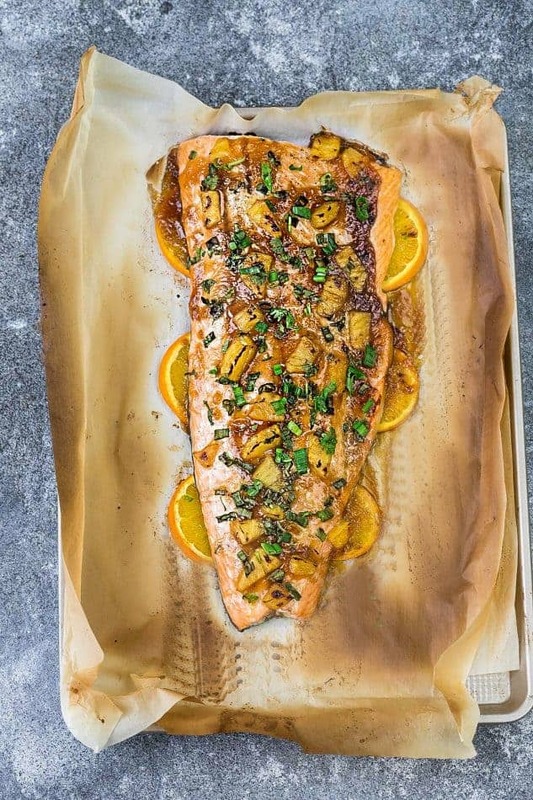 Fold parchment paper or foil sides up to prevent juices from leaking through (does not have to cover salmon). 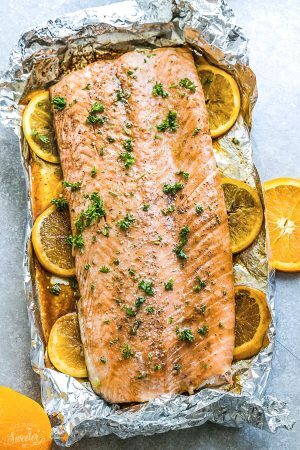 Bake in preheated oven for 12-16 minutes (depending on how large your fish is), or until the salmon is cooked to your desired doneness. 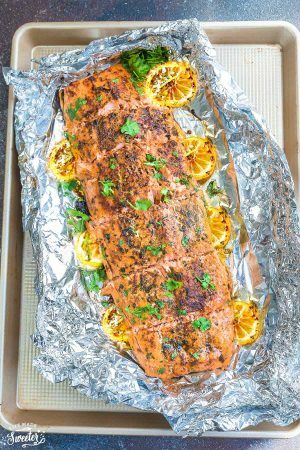 Unwrap the salmon, and turn to broil - cooking for an additional 3-5 minutes, or until caramelized and slightly charred. Cut into sections, discard skin and serve immediately with extra sauce drizzled on top and your favorite sides, garnished with green onions and cilantro.